We are all pilgrims and our life is the pilgrimage. The journey is to discover the inner chalice of our soul. This is the allegory behind the legend of the Holy Grail mysteries. Spirit speaks to us in many ways, a feeling or a calling that beckons to us. The experience is inner but the places, especially sacred sites that have been centers of spiritual life and ceremony on earth, have considerable influence on human destiny. Stonehenge, the Great Pyramid at Giza, Glastonbury, ancient Isle of Avalon in England, the red rocks of Sedona, Arizona and the Grand Canyon are a few of the many powerful vortices on Earth. These places can facilitate our quest to awaken, remember and know our sacred self, offering meaning in our lives. My head deep under the current waves Emotion. Will heaven truly come to Earth? on our Planet Goddess Earth? Adonis, Jesus and Arthur have come. We drank beneath golden boughs. in this time continuum spiral. Our Mother Earth is birthing. Avebury is the largest known prehistoric site in Europe encompassing 28.6 miles. It is just 18.6 miles from Stonehenge. It was in 1743 that antiquarian and scholar of sacred history and cabalistic science, William Stukeley (1687-1765) identified Avebury as the Winged Serpent Temple. The serpent was also associated with the "dragon". It was formed by 2 curved avenues of standing stones, which met within the Avebury Circle. He interpreted the overall design as an alchemical symbol of sacred energy, created and used by Druid Priests to attract divine influences and sanctify the whole countryside. He also perceived the entire prehistoric landscape of the UK laid out in a sacred pattern with Stonehenge and Avebury being the main centers. In ancient times there were two separate circles within the large Avebury ring. This was the place for the masculine-solar and feminine-lunar energies to come together for the fertility of all life, crops and the balancing of energies both personally and globally. This is a observational clock, as well as a connecting place for other stellar and extraterrestrial connections. 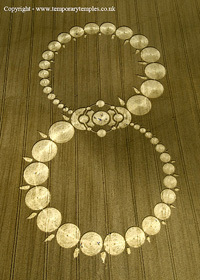 It is no wonder that the majority of all the mysterious crop circles have appeared in or just outside Avebury. There is nothing quite as awesome and energizing as being within the inner circle of the most magnificent ancient "Temple of the Stars" - Stonehenge. Our group will have special access into the inner circle of Stonehenge for an activation ceremony. Stonehenge is the main artery on our Earth Grid. It is here we can assist our Earth Mother and connect to the Sky Father, as well as to Angelic, Devic, Star Beings and Ascended Masters in raising the vibration and consciousness to that of light, love, harmony and peace for all Sentient beings. 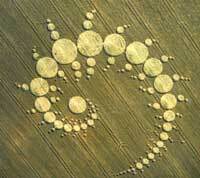 Goddess Willing - we will be blessed with crop circles as they magically appear. Yeshua and Magdalene are now more than ever working with and through us to insure the safe ascension into the Age of Aquarius. We invite you to Return to Avalon’s inner Temple. Here the blueprint and the codes of Light are ready for the activation and initiation of your Divinity. Many are being called to these sacred places on Earth to find their Holy Grail, the inner chalice of the heart. When found this brings deep peace and perfect balance. We then remember the reality of our multi-dimensional potential and awaken the ancient ancestral knowledge of our star lineage, the truth of our existence. This opens our inner sight and we then see clearly the light on our path. By living from our heart, we know and express our true destiny. This more than anything, will assist Earth and humanity during this chaotic time of the shift of ages. “You are the one you have been waiting for”. This is the dawning of the Age of Aquarius and You can Bee the change we wish to Bee! 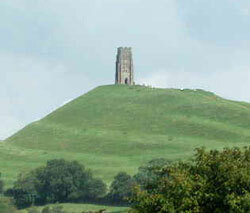 We begin our 10 days in Glastonbury, the heart chakra of Gaia, and the ancient Temple of Avalon. We are truly blessed by having the entire Healing Waters Retreat House for our group for 5 nights with full kitchen privileges. It has a peaceful sanctuary room where we will gather in circle each day to share and it is also a place for quiet reflection or meditation. From the deck of Healing Waters overlooking the River Brue we have the most spectacular view of the Glastonbury Tor, often hidden by the early morning mists of Avalon. There are 6 lush acres of grassland with a wonderful organic vegetable garden. Last year, in the middle of the field a new sacred spring emerged with a powerful, but serene and feminine white dragon energy. Juliet the visionary guardian has a heart of gold and is as loving, kind and beautiful as the retreat center she has created. 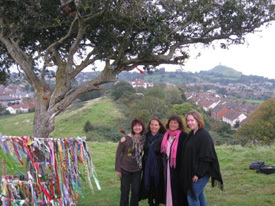 Glastonbury has been a sacred center of initiation since 5000 BC megalithic times and on through history for the Druids. It was the birthplace of the Piscean Age, the template of the Christ and Magdalene, the union of the Divine Masculine and Divine Feminine continuing as the Goddess site and mystical land of Avalon. In the serenity of Chalice Well Gardens, we will attune to the timeless beauty and drink of the healing waters of the red and white spring, the vesica pisces of creation and balance of divine male and female. Legend speaks of the arrival of Celtic Saint Bridget of Kildare - triple goddess of poetry, inspiration and healing - who is said to have dedicated a chapel, holy well and healing sanctuary to Mary Magdalene. This 2 hr. channeling of the Magdalene-Sophia energies by Jewels Maloney will include a channeling for the group followed by questions and answers on any topic of interest. A morning in beautiful Otterton, deep in the undulating feminine folds of Devon landscape and it’s rich red soil. 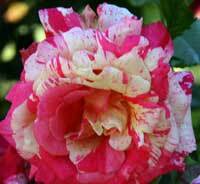 Sandra Marie invites us to share her home for an exploration of the Rose, its symbolism and healing power, connection to the Divine Feminine essence, the Magdalene and the Alchemical mysteries. We will have the opportunity to experience and work with the energy of the Rose, bringing consciousness to any residual internal blocks to fully opening the pathways and the Rosegates to the Chalice of the Heart. Today is Magdalene’s Day! We will gather for a final circle in Avalon to offer our love and gratitude for all we have received in the five days together in Healing Water’s retreat house. Then we will board our royal coach and bring this with us as we travel through the Salisbury plain to arrive at our final destination, the magnificent Cathedral city of Salisbury. 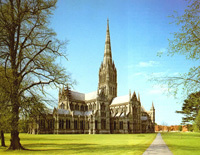 The official name of the 753 year old tremendous Salisbury Cathedral with the highest beacon “light house” spire in all England is the “Cathedral of Saint Mary”. This is were we will be staying for the night. We will then meet with beautiful sacred crystal sound artist, Catherine Gaze and friends for afternoon tea. For many years, Catherine has been presenting powerful activations and making important linkages with sacred sites using sound and crystal in the inner circle of Stonehenge and around the world as a gift to the Earth. 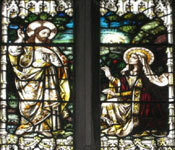 She will surprise us with her assortment of crystal singing bowls, gongs, monochords, and crystals for an extraordinary sacred sound ceremony and celebration, dedicated to Mary Magdalene in Stonehenge in the evening. We will be spending our last 3 nights in Wiltshire County, near the old market town of Marlborough which is surrounded by the splendid effigies of the chalk white horses on the hilltops. We will snuggle into our comfortable home retreat house in the picturesque old english thatched village surrounded by the ancient Savernake forest. It is part of a quaint 16th century pub that has great food and wonderful desserts. This is where we will enjoy our farewell dinner on July 25….the special Mayan day known as the “day out of time”. We will be staying in this area where the majority of the crop circles appear each year. Of course we cannot promise they will appear, this is up to our Mother Earth and the “Shining Ones” however, for the last 20 years they have manifested in and around Marlborough and Avebury. 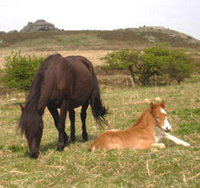 June and July are usually the best and most prolific times for them to appear and we will visit as many as possible. 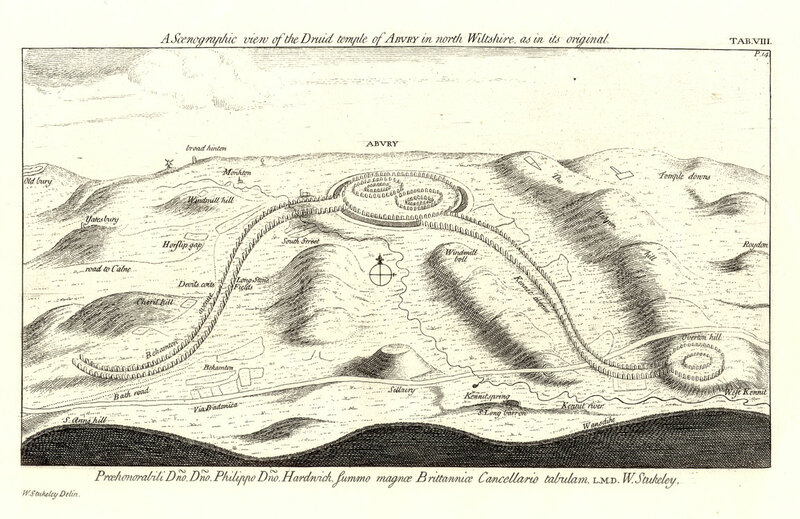 There will be a day of initiation, as we weave through Avebury’s “Winged Serpent Temple”. 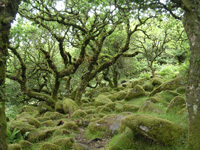 This sacred landscape is the largest stone circle and the power spot of England’s Mother Goddess. With reverence and in dance and song we spiral to the center of the Sanctuary. This is her place of prayer and creation, where the energy lines called the Michael and Mary lines unite and form a powerful celtic cross of energy. 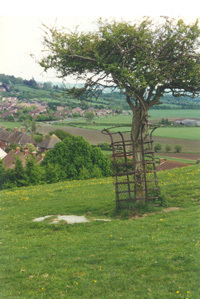 We will then walk up and enter the holy chamber of West Kennet Longborrow. 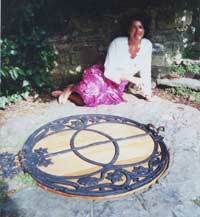 This is the womb of the Great Mother Goddess for birth, death and rebirth. From here we have the best view of her pregnant belly, Silbury Hill , which is also a galactic “signal station”. The massive stones of the “Avenue” lead us to the inner ceremonial center of the Sun and Moon circles. Here is the place we come into balance in sacred union with the Divine Masculine and Feminine energy. One of our favorite places to shop, The Henge Shop”, is right in the center of Avebury. 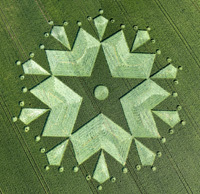 It is owned by my dear friends, Philippe and Dominique, They always keep us updated on the arrival of the newest crop circles and usually have the latest photos of them, great books, jewelry, crystals and gifts. Time for a good meal or tea and cake at the local café. Before we leave Avebury we will pay our respect, giving thanks to the magnificent parent creator stones, Adam and Eve. "The Way of the Rose"
When you pay your deposit please email me and fill out the contact form here. It has been over 5 years since the US Dollar was this strong against the British Pound. This makes it a great time to visit England. The sooner you pay in full, you will ensure this exchange rate. Prices are guaranteed based on a minimum of 8 people. 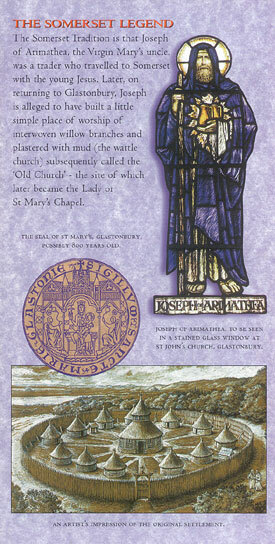 The trip is calculated in the British Pound for the 10 day pilgrimage. The 2011 price is guaranteed unless the $US/ £GBP exchange rate drops 5% or more from the current January 2011 rates or if gasoline prices go up 5% or more from that time. If required an extra surcharge or fuel charge will be declared by June 1, 2011. This has never exceeded $100 in the many years I have guided journeys. When we receive your deposit, we will send flight and other important information. • Private coach to and from London's Heathrow Airport and all other ground transportation. We will be staying in lovely and quaint but small B&B retreat homes with the possibility of sharing a bathroom with others. Cancellation Policy: The deposit is non-refundable. Cancellations made before May 1, 2011 will receive 50% of the amount paid, not including the $450 non-refundable deposit. No refunds will be made on later cancellations. Email your airline flight information. We are not able to accommodate return departures from London Heathrow in the early morning. If you must fly out early, you are asked to find transportation to London Heathrow and stay overnight near the airport or hire a taxi (this will cost over 90 pounds) from the B and B we will be staying at the last night of our journey. Other expenses you will need to cover during the pilgrimage are lunch and dinners, with the exception of the 2 dinners that will be provided. For meals, depending on what you eat and drink you will need at least $500.00. The only other expense is in tipping our driver. It will be important to purchase at least 100 British pounds before you arrive as the first couple days we may not be able to get to a bank machine. There will be ATM’s (called “hole in the walls” in the UK) near most of the places we will be staying. Many, however not all, restaurants and shops accept VISA not always American Express or other credit cards. - Only bring one small piece of luggage and a carry-on. You will be responsible for carrying these, so make sure you can handle them. - Layered clothing, as the weather in England is unpredictable An umbrella is always advised. A deposit of $500 is due now to secure your place on the pilgrimage. The balance is due on June 1, 2011. If the balance is not paid by this date we reserve the right to regard the reservation as cancelled. AstroJourneys suggests you purchase travel insurance. AstroJourneys is not responsible for any loss or injury incurred during our tours. Astrojourneys recommends travel insurance to cover last minute emergencies, as no refunds are possible once hotel and local fees are paid May 1, 2011. Unless you find someone to take your place. Elizabeth HeartStar Keller has been living most spring/summers in Glastonbury-Avalon and guiding self-questing pilgrimages since 1993. 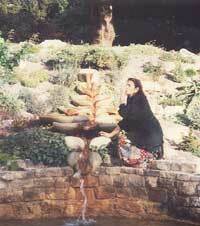 In spring of 2007 while in meditation, the spirit of our beeloved honeybee came to her. 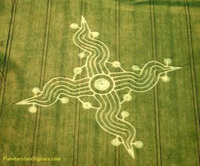 She felt the Earth Mother communicate to her the need to bring people together in ceremony in Avebury. Read more about the Honeybee ceremonies on the Bee Here Now page.